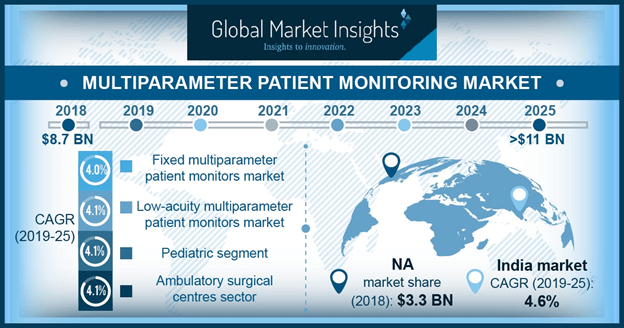 Multiparameter Patient Monitoring Market size is set to exceed USD 11 billion By 2025; according to a new research report by Global Market Insights. Increasing geriatric population suffering from chronic diseases and requiring critical monitoring will surge demand of multiparameter patient monitors devices rendering positive impact on industry growth. According to WHO, World’s population over 60 years will get double from 12% to 22% between 2015 to 2050. Majority of the geriatric population suffers from chronic ailments. For instance, prevalence of heart diseases is high due to diabetes in elderly people. Multiparameter monitoring devices are highly preferred as they provide accurate monitoring results. Thus, high adoption of such superior quality multiparameter patient monitoring devices in treating the geriatric population will augment the industry growth. Increasing technological advancements in multiparameter patient monitoring devices leading to development of innovative products will drive the industry growth. Changes in technology coupled with convenience and accuracy associated with multiparameter patient monitoring devices will upsurge the demand. For instance, Skanray Technologies launched TruSKAN, a six channel multiparameter patient monitoring systems that provides integrated pulmonary index for patient’s respiratory status along with other vital parameters. Availability of such technologically advanced multiparameter monitoring devices will augment the business growth. However, stringent regulations for manufacturing of medical devices will hamper the multiparameter patient monitoring market growth. Moreover, low affordability rates in developing countries due to high price will further impact on industry growth. High acuity level segment held 43.8% market share in 2018 and it will show lucrative growth during analysis timeframe. Technological advancements that have enabled monitoring patient’s health on multiple parameters will drive high acuity segment growth. Also, wireless network for such monitors reduces clutter of wires in ICU. Further, monitors also provide alarm notification under critical situations and hence,such technological integrations in high acuity patient monitoring devices foster the segmental growth.